Lollipop 5.0.2 upgrade Issues in Lenovo A6000 Plus, A7000 : Lenovo Smartphones series sales are rocking each a day on online selling sites like Flipkart, Ebay etc… at affordable costs. Lenovo stood ultimate in providing features also. Due to this most of the users are tending towards Lenovo Smartphone series like Lenovo A6000, Lenovo A6000 Plus, Lenovo A7000. Lenovo A6000 and Lenovo A6000+ are launched with Kitkat 4.4 android operating system. But Recent Android OS Lollipop Update made users to think how to upgrade Lenovo A6000 and Lenovo A6000 Plus from Kitkat to Lollipop 5.0.2 version. 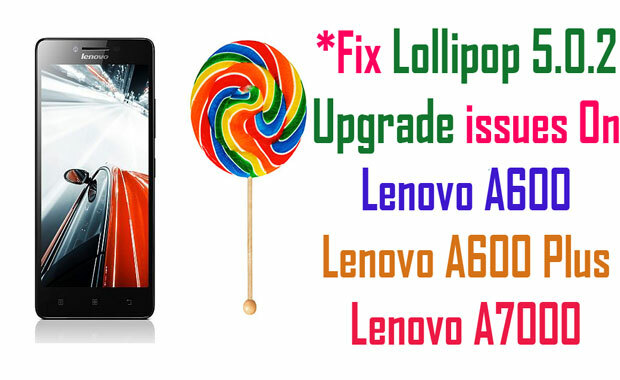 On successful upgrading your Lenovo smartphone will be updated to latest Lollipop 5.0.2 version. Later on upgrading there are several issues arised. New Lollipop 5.0.2 has a great interface and awesome look. Only thing users of Lenovo A7000, Lenovo A6000 and Lenovo A6000 plus are experiencing serious Lollipop 5.0.2 upgrade Issues. In this tutorial I am going to show you some serious issues troubling Lenovo A6000, Lenovo A6000+, Lenovo A7000 users. Our team composed some possible guides on Lollipop 5.0.2 upgrade Issues which will definitely resolve your concerns. Whatsapp Contact Sync & Gmail Contacts Sync Issues. Call log or Dialling Log Issues. Google apps and App Locker Installation issues. Changing Default launcher in Lenovo A6000 plus. Heating issue in Lenovo A6000, A6000 plus, A7000. Call log or Dialling Log Sync Issue fixed in Lenovo A6000, Lenovo A6000 plus, Lenovo A7000. After upgrading Lenovo A6000, Lenovo A6000 plus, Lenovo A7000 from kitkat 4.4.4 to Lollipop 5.0, 5.0.1, 5.0.2 Among lot’s of Lollipop 5.0.2 upgrade Issues primary one you are going to see is Call Log or Dialling Log Sync. Soon you upgrade when you click on Call Log you will be displayed with phone numbers only no contacts names will be shown even you saved contacts in contacts manager. To fix this issue go through our responsive tutorial Call Log & Dialling Log sync fixed on Lenovo A6000 plus, A7000, A6000. This is not a major problem we can fix Heating issue in Lenovo A6000, A6000 plus, A7000. 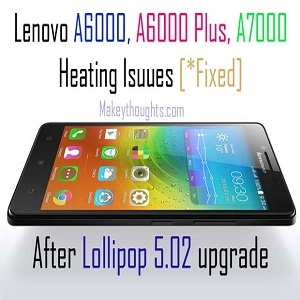 Heating problems arises when device battery gets heated this in turn reduces the battery life, drains battery away fastly, To fix this issue go through this tutorial and get complete details How to SOLVE Heating issue in Lenovo A6000 plus, Lenovo A7000, A6000 on Lollipop 5.0.2 Upgrade. These are the Lollipop 5.0.2 Upgrade issues spotted by our team. If you are having any other Lollipop 5.0.2 Upgrade issue do inform us through commenting system we will participate in tech forums and try our level best to get solutions for you and will update this article. Many other users may also gets benefited and resolve their Lollipop 5.0.2 Upgrade issues on Lenovo A6000 plus, Lenovo A6000, Lenovo A7000. Just visit to Lenovo service center. there they can degrade it to Kitkat. I got it done free of charges. hey makey i have facing many problems after upgrading my lenovo A6000 to android 5.0.2.. it hangs so much even games hangs so much.. it was good on 4.4.4 but after upgrading my cell has become too slow. what can i do ? Recent marshmallow android update will be getting for lenovo phones in mid of 2016 year. Let’s wait for it. Hey frnd how u upgraded ur lenovo a6000 plus to lollipop version please help me . And meny problems…KitKat 4.4.4 is very good then lollipop please do suggest me. thanks very much sukhvinder , your suggestion worked for me. However, I could not find the developer option in settings.. so i had to google to find way to get that option!! I recently upgraded my a 600 plus .. the first problem was that call logs were completely jinxed but after restoring the factory setting that’s solved but as lead to a host of new problems the primary one being that if i am browsing and i get a call i cant seem to answer the call, The call pop does appear but noting happens ending up being a missed call. moreover even while the phone shows service provider range if a person is to call me would find that my phone is unreachable i would only be aware of this fact about the calls maybe after sometime when i receive my missed call alerts via text messages . For me also same problem.reover even while the phone shows service provider range if a person is to call me would find that my phone is unreachable i would only be aware of this fact about the calls maybe after sometime when i receive my missed call alerts via text messages . Please let me know if u find any solutions..
Do exit the browser as soon as u get the pop up update of call then go to dialer then in that go to present call and then u can receive the call…. I would like to downgrade my Lenovo A6000 pluse from lollipop to KitKat. Kindly do the need full….!!! Hey its Anand I want ask that how everyone is getting the lollipop update but as I check on my lenovo a6000plus it is showing that it is the latest version . So what to do please help ..
4:From recovery menu Select install update form SD Card or External. 5: Soon select .tar file after that follow installation instructions. i have recently updated my lenovo a6000 after that its hanging and heating problem is more and it takes more time to fetch whatsapp contacts plzz tell how to degrade it to old version…its worst update by lenovo..
No such email I’d or phone no. I tried to log in with my friends email I’d and pwd also but. The same problem persists…please suggest any solution…. After upgrade lollipop version schedule message not show so how to use schedule message ? hellO sir, I have a upgrade to lollipop note I am unable to write to sd card using any third party file explorer(es file explorer). it asks for permission and then a dialogue box appears due to a ui error I don’t see any option icon which is needed in order to provide root to file managers….plz help sir. hi, my lenevo 6000 plus not getting lolipop update. when i am trying to update it is showing your system is latest version and it is kitkat only. Plzzz update lollipop version in my phone wi8out any problem. Hello, I am unable to install Facebook app in my Lenovo A6000 after the updating the system to Lollipop version. Initially, I suffered with contacts sync issue and I got it done by restoring to factory settings. But since then, the Facebook app is not working at all in mobile. And I tried for many times to un-install and re-install, but the problem remains same. Please guide me in this regard, if you come across with such a problem. Hi,after upgrading to lollypop 5.0.2,in my Lenovo a6000+, Whatsapp, facebook massenger is not working over mobile data,its working only on wifi. i am using vodafone 3g.please help me. hey! I was recently received a Android update in my lenovo a6000 plus but now it dosent shows any updates so;how I was able to resolve this problem . after upgrading to Lolipop my lenovo A6000 become very slow, if i dial a call it takes one minute to display, earlier my contacts name were not appearing but I have reset factory data & it solved the problem. All my APN’s are gone and I am unable to add new APN. Also, will factory reset erase all the data? Did you tried by factory reset ????? Take backup and try factory reset one of the client at lenovo forums got fixed…………..
Do you have any update on my request? Absolutely useless post. Hard reset doesn’t help to solve this issues. After the lollipop update on my Lenevo A6000+ the camera quality degraded, specially the front camera. I am getting granules on my pictures as well as the settings of the camera are not there. I have bought lenovo 6000plus..
Actually i get an update option to lolipop.. But there are so many time i was try to update..but every time i can getting error..In bios…after downloading..
Hi I didn’t get my lollipop upgrade. It reads this is the latest version. After upgrade to lolipop version mobile getting slow performance also getting some issue when some one calling that time mobile getting hug please fix that. It’s been a disaster after upgrading my A6000 from Kitkat to Lollipop. The phone running very slow, too many lag etc. I’ve read a glimpse the comments above, is there any possibility just to fix the lollipop for A6000 instead of downgrading to kitkat? I think it’s because of the RAM and Processor that is not sufficient to run lollipop, so maybe….maybe you can modify to reduce the usage of RAM. CMIIW. Anyway I really really hope there’s a solution for these issue. Hi i am facing the same problem after upgrading my A6000 from Kitkat to Lollipop. follow comments section to get old version. Some people who also faced similar problem posted the solution.. thanks for visiting our website. I am using my lenovo a6000 and I upgraded to lollipop 5 0 2 version, from then mphone has been changed continuously I am so upset. The major problem is when I suppose to go to data on it will take more time to open and the phone would be going to hang till the data service is on.. Please give me solvation from this problem..
@ Makey, Joseph When will we get the update for fixing 5.0.2 issues..?? please mention the date, we r getting problem..
we are trying to fix the problem soon we will update…..
lollipop has some problems with lenovo mobiles. we recommend you to wait until marshallow update. I update my lenevo a6000 to lolipop 5.0.2 with official update, After that my phone become slow to often hang and other issues. Any suggestion to fix this. there is some problems with lollipop upgrade so wait for new version of android…..
after upgrading lollipop os my mobile getting hang when i open in messages even my phone contains only very few messages so kindly help me to sort out this issue. the second problem which i fased when i touch contact for calling is not immediately calling after touch second time only is calling so kindly help me to sort out this issue. Facing so many problems in Lenovo A6000 after upgrading to lollipop… Please help me how to go back to kitkat. Guys don’t panic.the update is OK.its just transition coding day gets confused.just make a backup using any app ur contacts and everything and do a factory data reset.if u have any other query u can ask.I’ll help. After upgrading android 5.0.2 , my mobile is hanging badly , even my storage has 2gb free space still it lags badly, need help to solve this problem. If you experiencing slowness, kindly restart the device in recovery mode. Before moving on ensure to take a backup of your device data. To navigate between the steps use the volume up/ down button and power button to select an option. Now choose the Wipe cache partition and wait for the things get done. Next select Wipe data/ factory reset menu. Once done reboot your A6000/A6000 Plus. Guys See below youtube video and find how to downgrade from lollipop to kitkat. I have done for my mobile and noe it’s working very fine. Hi gallery folder is missing in lenovo a6000 after lollipop update. How do I get it back? Mine is “Lenov a6000plus” last month i brought from online. my phone is not connecting with other device. it showing error for connecting the device. I restore/reset my phone also, but it is not connecting with other plz help me. Lenovo a6000 mobile and data connection speed inbilt mobile settion open mobile system…. Some of my apps are not showing up on the menu ( lenovo launcher) .I tried uninstalling and reinstalling them…but this didn’t workout … so can ou help me? Hi friends I want instal android lalipop 5..
After upgrading from KitKat to 5.0.2 lollypop in my lenovo a6000 plus, I can’t open my gmail and messaging app. It shows the contents inside but when I open it up, it disappears..please help me out..I can’t read my mail and messages. Even my call log app is missing. Hi, I am using lenovo a6000 plus mobile, now lollipop version is available for this model, is there any problem with this update, can I update my mobile to lollipop? Reply me as soon as possible. After opening gallery, in 2 or 3 seconds gallery closes automatically.. Why does this happen? My A6000 plus was continuously asking for upgrade as new upgrade is available but, when I updated it, I found it as sleeped and not ready to boot. it is only coming to LENOVO screen and not moving further also. what to do, can anybody tell me. I have updated my a6000+ recently. I am facing camera problem. Clarity of camera is no way near to previous on in KitKat version. How to get previous camera quality can anybody tell the solution..
hello, I also have the same problem, could you help me? After updating my a6000pkus the only thibg i faced is heavy battry drain issaue the most of tha battry..the percentage of Android System is always same as percentage of Screen battry usage..sometimef Screen Like 56 or 60 percent.which is npt normal.however screen batry usageofeing on top is normal..I use wifi..is this problem coming by this or someothr?? Please helpYa me out..and suggst should i do downgrade..or juat wait for next updat..
Yasim dOWNGRADE IS bit difficult……..marshamallow update is coming soon wait for some more time…………. After I Upgraded from Kitkat to Lollipop 5.0.2 iam not able to read messages, compose mail. When i try to read a message or compose a mail it automatically goes back to the Home Screen. I am a lenovo a6000 user. After my update to the latest lollipop, whenever I try to delete a file from the SD card using e S explorer or a video from mx player, there appears a pop up message asking me to define the root sd card directory (along with images for the procedure) when I clickon select, it lead to another window as shown in the images. However. In the new window, there is no pop down option with the three dots as shown on the next image. MX Player Closing automatically at sound level above 10(in headphones) after updating a6000 to lollipop 5.0.2…..
Pls help how to fix it?? My camera functions like zoom is not working, video mode is uncontrollable. Even factory reset also could not help me. 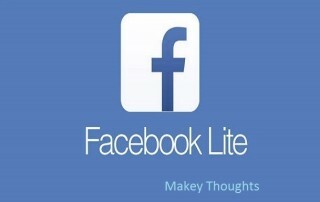 When i install facebook application its get installed but logo (icon) not show….any body help.???????. there is no usb popup, that is when i connect my usb, it went on charging only , please help me solve this problem. I hav an issue wid my fb icon.. It isn’t seen on my phone over the screen…Donn knw wat to do..plz help me figure out the problem.. I am having Lenovo a6000 plus its not working good. I had done factory reset 3 times but after starting again it will again starts to install unwanted applications automatically.. I m fed up with Lenovo working. if I try to update my software version then after full download its not support to install new updated version. please help me to make my issue resolved. Hello. Am using Lenovo A6000+ mob. Am facing prob wth fb app from past few months. Though the app is installed in my mob, iz not showing icon on my home screen. However all these days am accessing fb app by placing widget o home screen. A couple of days bck my mobile is updated automatically n from then am neither able to place fb icon nor fb widget on my home screen. Itz really very irritating to go to ply store each n every time as itz the major app I use daily. Kindly someone help me to sort out this prob ASAP. I’m unable to connect to internet by leneovo A6000 smart phone. First 10 days I’m able to connect thru wifi but now I’m unable to connect. not sure what happened overnight to my phone. Now either way WIFI/SIM data plan I’m unable to connect to internet .so my smart phone become waste phone /normal phone. Appreciate your help if there is any fixes to solve this issue. Hey ! Recently I updated my lenovo a 6000+ to 5.0.2 lollipop and after updating my cell the charging of battery is so slow that it takes generally 3hr to charge 30% -35% and cell gets heated. Please suggest me what to do ?? I recently update my Lenovo A6000 plus in 5.0.2 lollipop and please tell me if i reset my phone so what my version lollipop will be changed to KitKat. I have upgraded to 5.0.2 Lollipop (Lenovo A6000 plus). The one and only issue, being the main issue is even after deleting emails from the trash, all the mails are coming back to my inbox again and again. I don’t know whether this is caused b’coz of the up gradation to lollipop. Please let me have a solution…………..
My lenovo a6000plus lilipop do not reset also heating. Your all method I m do but no result. I have recently updated my 3 months old Lenovo A 6000 PLUS Lollipop 5.0.2 from authorised service centre in Indore. 2.Dialer Issues unable to dial or call the number in one go. It does not shows my saved number at times and keeps on saving them when I am using call intent. 3.Extreme Heatups and Restart Issues. This phone is crap why I bought . Today 21.04.2016 I visited the service center Ensure Support (Redinton India Indore) Ground Floor, Malwa Tower 10, Block #5, Old Palasia Guitarwala Square, A.B.Road, Indore 452001. But due to long power failure they even don’t take my phone for repair. upgraded to lolipop version. Now i wonder y i did this stupidity. My phone hangs, very slow and worst performance . i hate this version , i feel like throwing this phone away its really irritating. What is the problem?how to resolve? After upgrading to lollipop 5.0.2,I am not getting notifications from apps except fb,whatsapp & messenger! Also sometimes when i save a contact it is saved but later when we find it doesn’t shows any result..
Hotspot pronlem , while turning hotspot it’s showing error . No error messages . Plz fix my issue . Lenovo A6000 is a totally loss phone. You even can’t dial, search a contact. This is furious. No way to use Lenovo. I suggest all buyers please put your phone into a dustbin and go with some other brand, otherwise you will be doing factory reset, root, degrade/upgrade all the way for such a non fixable issue of Lenovo. Rest is up to you.. I upgraded my a6000 plus to lollipop and now i am facing the following issue.whatsaap , dictionary, and some apps icon are not seen on my phone screen. but they are installed in the phone and can see it in the apps.after upgrading, system restarted and lost those apps .but still it exists. i uninstalled and reinstalled all the aaps but issue are not solved. please help me. i didnt get any help from any other friend locally or they have no idea. if anyone have any idea to solve my issue please help me in this , so i will remain ever thankful to you.possible please email. my email is abhilashdsar@gmail.com, mob0 9434276005. My lenovo a 6000 is getting over heated..I tried the method which you given above.And i cant upgrade it to lollipop(previously i upgraded it and downgraded to kitkat again). Can you please help in this.I need a solution for both for heating and upgrading. battery drainage very fast yaat in lollipop update..
Friends, My mobile date not connecting properly. Once rebooted it’s working for a hour aging going bad. Help me know what to do? I have lenovo a6000plus but till now i am using the kit kat version..upgrade is available but i have not updated yet..in in this kitkat version,,more apps are not working properly such as app lock..it locks the apps successfully but anybody opens the apps without entering any password or patterns that i had set….so what is the solution…will my problem be resolved after system upgrade or any other problem….reply me soon on my email id or phone…. After upgraded to lollipop my phone touch not responding at one side …. Now what can I do? My Lenovo handset already contains 5.0.2 but getting prompt again and again that update available. Tried two three times to update my device but not able to do the same. Please suggest how can I get the latest one. Friends..when ever I takes pic in my lenovo 6000 plus, two images are getting saved..
hello sir ,i am facing a problem in my lenovo A6000+ ,in other devices there is an option in settings >apps…….to force apps to sd card ,but there is no such option in my phone.what to do??? ?plz tell fast. In my lenovo a6000 plus app icon is not shown on screen but app is already installed. So what to do get icon on screen. hello m ,i am facing a problem in my lenovo A6000 After update5.0.2 network range not showing and also couldn’t connect the call and phone not pickup the range plz help mi m.